HERE AT FLORIDA NAILS WE TRY TO SHOW ALL KINDS OF NAILS. EVERYONE HAS A FAVORITE TYPE OF LOOK THEY LIKE. SO PLEASE LOOK AROUND AND I HOPE YOU FIND SOME PICTURES YOU LIKE. We have another bunch of pictures from Tigressa and two pictures I took with my new Olympus 3030 digital camera. To save time I put everything in the submitted picture page. Just go to the link..below.. Thanks Tigressa for the new pictures.. 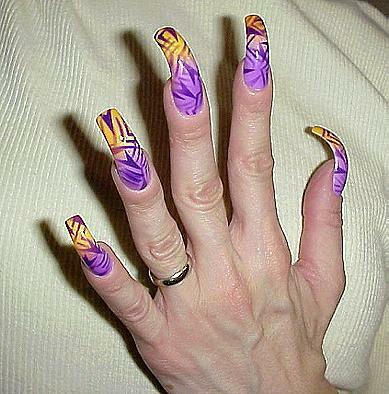 Here is a shot of Debra's nails.. All I can say is WOW ! IF YOU WANT TO SEND IN ANY NAIL PICTURES FOR THIS SITE JUST SEND THEM TO ME WITH ANY INFO YOU WOULD WANT ME TO ADD WITH THEM AND I WILL POST THEM..
HEY I SAW MORE ...CHECK IT OUT... VERY NICE FRENCH NAILS.